The top story on immigration of the year also happened to be the first. Within the first week of his presidency, President Trump issued three executive orders on immigration. The first two instructed immigration authorities to implement sweeping changes to the way they conducted and prioritized enforcement along the border and in the interior of the country. These orders included directives to create more detention centers near the border, hire thousands of additional Border Patrol agents, and withhold federal funding from so-called “sanctuary” jurisdictions that refuse to comply with federal immigration laws. The administration also ordered the immediate building of a wall along the U.S.-Mexico border. However, the most controversial executive order was the first version of President Trump’s Muslim travel ban. The order suspended the entry of immigrants from seven Muslim-majority countries for 90 days and halted all refugee admissions for 120 days. Syrian refugees were banned indefinitely. However, courts blocked this executive order within days, after advocates flooded airports across the country. In March, President Trump issued a second travel ban, which was blocked by courts until June, when the Supreme Court allowed a portion of the ban to go into effect. In September, President Trump issued a third travel ban. After the majority of Travel Ban 3.0 was halted by the courts yet again, in December the Supreme Court permitted the entire ban to go into effect while its legality is argued in the lower courts. Business immigration also underwent some significant changes this year, as President Trump’s Buy American Hire American executive order was introduced. In October, U.S. Citizenship and Immigration Services (USCIS) instructed its officers to review employer petitions to extend workers’ nonimmigrant visa status with “the same level of scrutiny” as they would a first-time petition. This directive rescinded the previous guidance, which allowed officers to give “deference” to previously approved visa petitions so long as there were no major employment changes or indicators of error or fraud related to the previous determination. Immigration advocates and business leaders alike feared that these changes would have a chilling effect on employers, particularly in the tech community, which frequently employs high-skilled foreign workers through the H1-B visa. Finally, despite efforts by the administration to prevent an Obama-era rule to grant parole to foreign entrepreneurs from taking effect, in December a federal district court judge ordered the Department of Homeland Security (DHS) to begin accepting parole applications of foreign entrepreneurs seeking to grow their companies in the United States. DHS terminated the Temporary Protected Status (TPS) designations for Haiti, Sudan, and Nicaragua in 2017, setting tens of thousands of people on a path to becoming undocumented and susceptible to deportation. Several other countries’ TPS decisions, including the largest designation for El Salvador, are expected in the first months of 2018. This temporary immigration status has been offering protection to an estimated 325,000 nationals from certain countries facing an ongoing armed conflict, environmental disaster, or extraordinary and temporary conditions. Many of the countries, however, are still plagued by crises years after the original designation was made. Many individuals with TPS have lived in the United States for decades and own homes, have established families with U.S.-born children, and make significant contributions to the country. They are also routinely vetted. The administration’s decision to end many of these designations follows a pattern of growing the undocumented population and targeting the foreign-born for removal when possible. President Trump ended the Obama-era Deferred Action for Childhood Arrivals (DACA) initiative in September, despite promising to show the 800,000 recipients of the initiative “great heart.” The administration announced its termination after being threatened with litigation by several states’ attorneys general who wanted it ended. The administration allowed anyone whose DACA was ending by March 5, 2018 to apply for one final renewal, leading to a sweeping panic among young immigrants, many of whom scrambled to submit a lengthy and expensive renewal application within the one-month deadline given by the government. This anxiety was compounded by the fact that a slowdown with the U.S. Postal Service caused many applications to arrive at USCIS past the deadline. 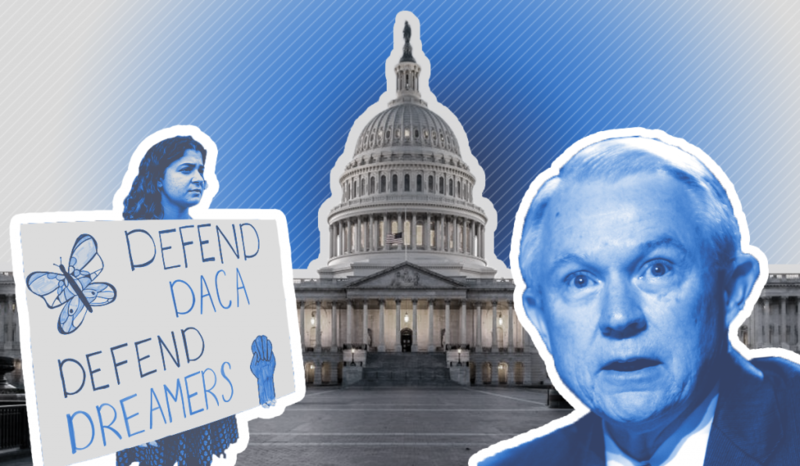 As more and more people fell out of status each day, the administration placed the onus on Congress to provide a permanent, legislative fix for DACA. After DACA was ended, Congress was pressed to find a permanent solution for its former recipients. The DREAM Act was up again for consideration in Congress by year’s end, which would have created a pathway to citizenship for as many as two million young immigrants, including the 800,000 former recipients of DACA. However, Congress failed to include it on the must-pass Continuing Resolution that was needed to keep the government funded. That means that the next opportunity for the Dream Act to pass is in mid-January when the new Continuing Resolution will expire.